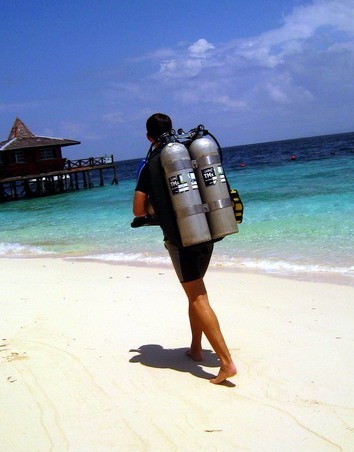 This is one of the most challenging scuba diving courses you'll ever take. During your training you'll practice more line handling, and a lot of procedures to cope with any emergency situation that may occur deep inside a cave. Over a period of 6 days you're headed deep into the cave well beyond the natural light zone. As underwater caves offer a rare window into the past, environmental protection is another major component of this course. Buoyancy control abilities and gas consumption are expected to be as good or better than those expected from entry level scuba instructors in order to maintain your buoyancy while dealing with a series of emergency procedures within strict time limits. These dives are going to be conducted at the "Turtle Tomb" in Sipadan, one of the largest known coral caves in the world (only limestone caves are larger). Being PADI Tec50 or ANDI TSD certified is a prerequisite to be able to undertake this course safely. Have a preview of what to expect at the "Turtle Tomb": click here. This course follows the philosophy of DIR founder Cedric Verdier and completion of the minimum course requirements does not necessarily lead to certification if the instructor has question marks regarding a divers' attitude towards cave diving.